Lutfur Rahman promised me a statement on what has been happening and he’s now kept his word. His team has just sent me a leaflet that they’re delivering across the borough. candidate, despite the fact he came a distant third in the election. campaign to be the candidate has made similar allegations. I have never paid for the subscription of another Labour member nor encouraged anyone else to do so. no open investigation into any of the allegations made against me. and twice failed to make my cabinet selection. Miliband, would the NEC have torn up the election result and made Ed Balls Leader? No, it would not. selection has been conducted as well as the allegations against me. drew up in partnership with local members as Labour’s candidate. membership card. But if Labour stands for anything it is FAIRNESS. is no, then please vote for me as your first preference on 21st October. PS remember, your vote is between you and the ballot box! Printed by Printing Hub, Unit 5, Stonefield Way, South Ruislip, London HA4 0JS. “removed on a whim” ??? If you say so Lutufr. Yes, removed on the whims of Roshnara Ali’s pressure on the Labour NEC and Abbas’s dodgy dossier! I guess democracy is out of the window in Labour and now its survival of the fittest, those who are strong survive! Labour is sowing with corruption more and more. democracy. the NEC forgot about it. Why inavde Iraq to bring democracy when its not respected in our own back yard??? I am a 50 year old born and grew up in Tower Hamlets, so I have seen a lot. We need to really be honest here; Luthfur Rahman won the Labour selection fair and square. The entire process was managed by the NEC, they had months to work out the process and over a year to sort out the membership list – more importantly; only members who have been registered before Nov 2009 were allowed to vote. –The Labour party had the time and chance so why did they not take the bogus members out? And if there were any, how could you be sure that they voted for Luthfur, it could have been for any candidate? This imposition is a stitch up by the cunning & divisive Rushanara Ali who has a personal vendetta against Luthfur and the disgruntled Helal Abbas – any fool can see that. I dare you to challenge that otherwise. I recall Ted writing in his blog that he made calls to the NEC and they confirmed to him that Lutfur is our candidate. So If Lutfur held a launch event at the Troxy then it was under the Labour party banner and it should be taken up with the TH Labour party (Dan, you were happy to be part of that). Opportunist such as Dan McCurry and Cllr Shahed Ali who both supported John Biggs should be standing for him and asking the NEC why they chose the third candidate over their man who came second. I would have not voted for anybody until I started reading Ted Jeory and Andrew Gilligan’s one sided attack on Luthfur and their scare mongering tactics –ask yourself why these senior journalist are spending so much of their valuable time on a daily basis writing about Tower Hamlets and attacking only one man? It made me more interested in finding out about the truth and I can tell you that I don’t have a shadow of a doubt that Luthfur is the strongest candidate with the leadership qualities to be the mayor. I really think it worked for the best that Luthfur is standing as an independent now he will be able to work across parties and take the best to his cabinet and deliver for the people of our borough. More importantly, we need to really ask ourselves if we should take sides of the divisive Rushanara and Abbas who have a personal issue with Luthfur or should we be fair and elect the fittest candidate out of the five that are standing? whatever Lutfur! You are HISTORY…. Ken Livingston did it. Yes you can. If Lutfur Rahman’s campaign are spending time distributing this leaflet then it is surely time wasted. The people of Tower Hamlets want to know what the candidates for Mayor will do to run the borough, not how they have been mistreated by their former political party. Anyone seriously annoyed with how Lutfur Rahman was treated by the Labour Party is probably already voting for him. Nevertheless they will be wondering why he chose to run as an Independent. So this background info is important David. No, most of the good people of TH who are not politically involved and just getting on with their lives, paying their council tax, sending their kids to local schools and expecting their bins to be emptied won’t care in the least why anyone is standing for any party or as an independent. They’ll just see a list of names and parties. And preferably, as David says, have received some information about what the candidates would do if elected so that it might influence their decision on who to vote for. Lutfur gets 433 votes and Helal Abbas gets 157 and the Labour NEC decides to chop Lutfur because of Abbas’s dodgy dossier and Roshnara Ali MP’s vendetta? Wow what ever happened to democracy? what ever happened to innocent until proven guilty? what ever happen to a fair trial? what ever happen to not listen to gutter journalism in the press? Labour seems to be becoming ever swayed by who ever has might and power and the law of the jungle rather than the law of civil society and democracy! Dan, would you like to refute what he says or are you content with barking meaningless crap? Having said this, I don’t believe Lutfur was removed on a whim. I disagree with him about this. 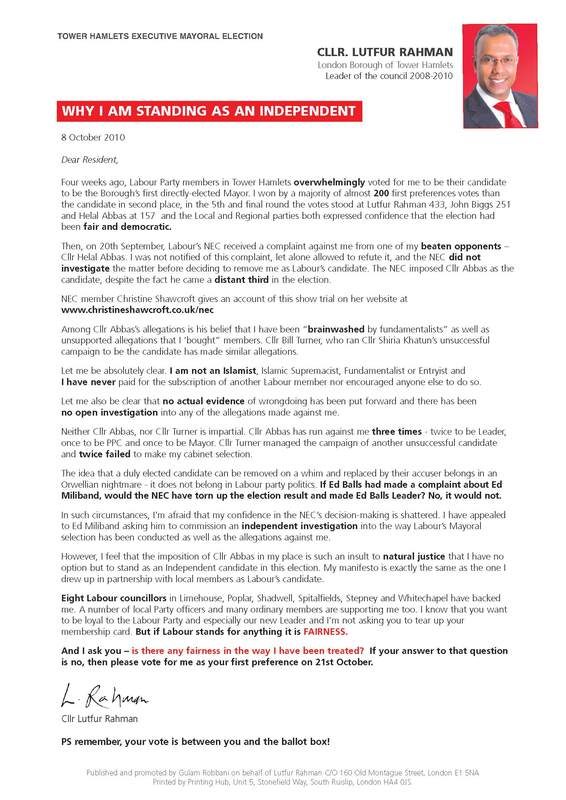 I believe Lutfur was removed in a totally calculated act of corruption at the very top of the Labour Party. Lutfer was suspending because he was and still is the Respect candidate in disguise. I do not understand why Respect did not put a candidate forward in the first place. They openly said if Lutfer was the labour candidate they would not put a candidate forward. During the referendum for mayor, respect were urging people to vote yes to mayor and when the time comes they do not put a candidate forward, that is quite absurd. I have grown up in TH and still live and work there. I have always voted Labour and itend to support and vote for Abbas. Abbas has been leader of he council 5 times which shows he is capable of the job. I have also met both Luther and Abbas and I found Abbas to be so much more likeable than lutfer who seemed fake and was only telling us what he assumed we wanted to hear and that is exactly what he is doing to the Bangladeshi community. Bangladeshis do not like Abbas because he says he will be representing all communities not just favouring the Bangladeshi. Tania, stop spreading silly rumours about Lutfur, people can see through what you guys are trying to do. Lutfur has been a Labour man before Respect even existed. It was under Lutfur’s leadership that Respect got seriously beaten, Respect got in when Abbas was the leader and we only held on to the majority by one councilor. SO STOP SPREADING LIES – YOU OWE IT LUTFUR FOR WHAT HE HAS ACHIEVED! Tony R your comments are not coherent. If Respect were so badly defeated by lutfur why are they supporting him and not putting one of their own candidates forward for the mayor election. Lutfer IS the respect candidate in disguise. The lutfer camp have made this election into a religion election and are going round telling the bangkadeshis and the Muslims that they must vote for lutfer or they are not Muslim. Tania you have really lost the plot. Please speak to Respect directly or speak to the former Respect chair, Azmal Hussain who is now Abbas’s chief advisor and they can tell you more about what they are doing. So how did the honourable Abbas get the Labour selection in the first place, you don’t find that disgusting? His fellow comrade John Biggs who came second was also undermined, so can you explain why the third candidate got the selection? Please don’t preach about disgusting games! The propaganda about Lutfur is Respect will not wash down with the non Bangladeshi community, please don’t make a mockery of people’s intelligence. Dear Tania It’s a sad day for Labour to make accusation against it’s former leader. The religious story only came about because Cllr Abbas used it first in his dodgy dossier and now he is trying to back track and blaming others for exploiting religious sentiments, double standard is what I say. Tony I think you have clearly lost the plot. I am merely making an observation. Why did respect not put a candidate forward and why are they supporting Lutfer? That is my question. Respect stated they would not put a candidate forward if Luther stood as mayor. Tony this is common sense. As for Abbas, I know that the muslim/Bangladeshi community do not like him as he is not Bengal/muslim enough and does not do as many favours for his Bengali/muslim as lutfer. John biggs is supporting the nec decision and also supporting Abbas, I also feel that biggs should have been made the candidate but I think it was tactic putting Abbas forward to get the bangladeshi votes. Agree with TH Resident: why do we get the MP taking sides ? Why is she not standing back and saying she will support whoever wins the office of Mayor according to what her constituents decide? After all this is supposed to be a ‘unity’ mayor. The people who want Abbas are the small Labour-based clique who run things behind the scenes at the council, who have little respect for elected councillors, or voters, and rely on this kind of infighting so they can continue carving up the borough for their business friends. They need Abbas as he won’t disturb their plans (and has never done so). Rahman on the other hand seems to want to rock the boat. An Abbas win will further entrench the present regime – there will be no reason for anything at all to change around here and nothing will.